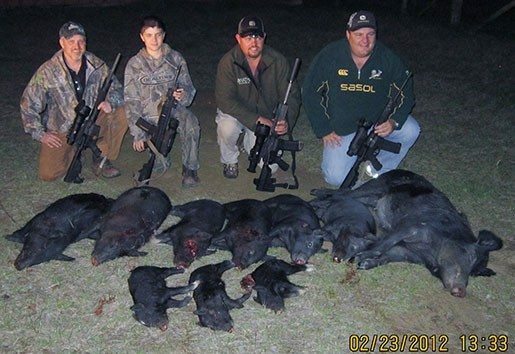 HogSWAT is a Tactical hog control company in southwest Georgia. 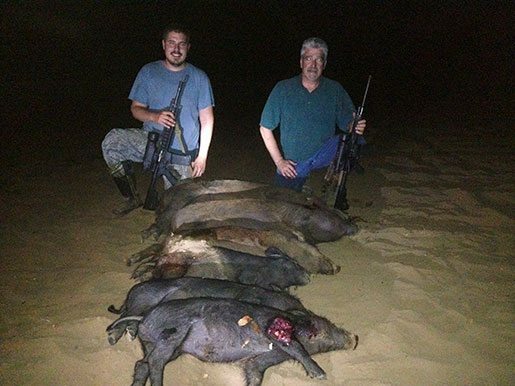 We offer fully guided night time hog hunts, year round with the best thermal optics and AR-15's. Average shot opportunity in almost any kind of weather, all year round..Including pouring rain and unfavorable wind conditions. Thats a one night hunt.. The % goes up with a 2 night hunt. 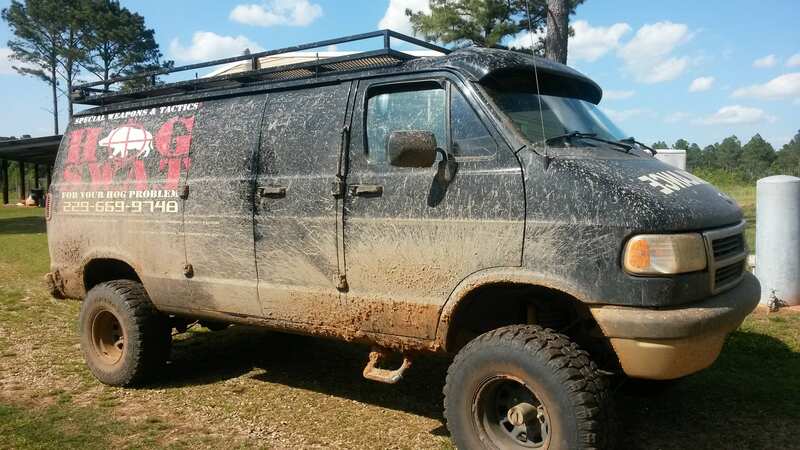 We use a specially outfitted 4x4 van, which has comfortable seats and a large monitor hooked to a long range thermal. We see out past 1000 yards, at night, 340 degrees around the van. You sit in climate controlled comfort as you scan thousands of acres of peanut fields. This is night hunting at its best. We use ARs, with Armasight thermal scopes, to harvest them. We do this year round. It’s a full time job. On a typical night, we have several encounters, at VERY close ranges. This is true spot and stalk hunting, in open fields. No captive animals or game ranches. Would you like to go with us? If we put you 60 yards from 20 pigs, with our gear, how many could you harvest? 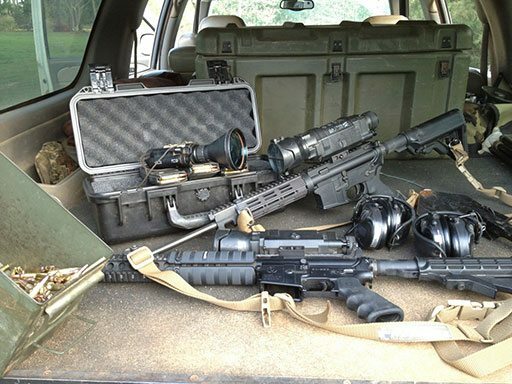 We supply EVERYTHING you need to hunt: weapons, optics and ammo. We even process your kills so you can BBQ then when you get home! If we can’t get you on hogs during your hunt, we will take you again, for the cost of fuel! We have about 85% success for one night, and 90-95% for two nights. These hogs are VERY good eating. They eat peanuts, acorns, corn, and watermelons, off the local farms. No antibiotics, steroids, or hormones. Just an all natural, nutty/buttery kinda goodness, on the hoof. You can shoot all your skills allow you to. NO HARVEST LIMITS. NO TROPHY FEES. The farmers NEED them ALL gone. It’s our job. It’s your adventure. We offer these services, in Southwestern Georgia, to the rural communities surrounding Leesburg, Smithville, Bronwood, Dawson, Parrott, Sasser, Americus, Andersonville, Desoto Plains, Cordelle, Arabi, Albany, and Putney, Georgia. This is a family run operation. We take pride in making sure our guests have an exciting and safe hunt. Hal and the Hog Swat team are all very professional and knowledgeable of their trade. I am proud to be able to hunt with them and most of all to call Hal one of my closest friends. Give us a call, and talk to us about your hunt today!